GABRIELE FERRO Music conductor. Son of the composer Pietro Ferro, he majored in piano and composition in Rome at the Conservatory of Santa Cecilia. He won the RAI young conductors’ competition in 1970, since then he has worked continuously with the RAI , the Santa Cecilia and the Milan’s Teatro alla Scala Orchestra and has continued tackling an international career abroad. He worked repeatedly with e.g. l’ Orchestre de la Suisse Romande, the Wiener Symphoniker, the Bamberg Symphoniker, the Gewandhaus Orchester of Leipzig, the Philarmonique and Orchestra National de France, Gürzenich, Cleveland, Chicago Orchestra, WDR, BBC and Radio France Orchestra. Up from 1978 Ferro has been guest in many Opera houses i.a. La Fenice in Venice, the Opera of Rome, the Teatro Comunale in Florence, the Bastille and the Châtelet in Paris, the Grand Theatre in Geneva, the Real Teatro in Madrid, the Bayerische Staatsoper in Munich, the Covent Garden in London, the Chicago Opera, the San Francisco Opera, the Los Angeles Opera, the Tel Aviv Opera, De Nederlandse Opera and Deutsche Oper Berlin. 1979-1997 he became Principal Conductor of the Orchestra Sinfonica Siciliana, after in 1987-1991 Permanent Conductor of the RAI Orchestra in Rome and then 1991-1997 Artistic Director of the Stuttgart Staatstheater . In 1986 he conducted the Covent Garden Royal Opera House at the Tokyo Bunka Kaikan in Japan. He has been invited also by Yomiuri Nippon Symphony Orchestra. Guest at the major music festivals such us the Wiener Festwochen, Schwetzingen Festival, Schleswig Holstein Musik Festival, Pesaro Festival, Maggio Musicale Fiorentino, Ferrara Musica and the Biennale in Venice wich awarded the konzert with a Golden Lion in 1997. 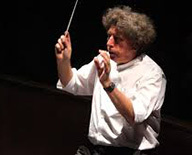 2001-2006 Principal Guest Conductor of Teatro Massimo di Palermo. His repertoire ranges from classical to contemporary and he is known to have performed with wide acclaim Premiere works such as Berio, Clementi, Maderna, Stockhausen, Ligeti and Nono. He conducted a highly successful production of Strauss’s Elektra in Naples which was also awarded the Abbiati price. Last year he conducted in Stuttgart a new production of “ La Sonnambula ” of Bellini, recently awarded as the best opera performance 2012 in Germany. Invited by Piero Farulli he teaches Orchestra Conduction at the Scuola di Musica di Fiesole. He has recorded for Sony, Emi, Erato and Deutsche Grammophone. He is a member of the Santa Cecilia Academy.